Ohmme is a smart band penning real songs. 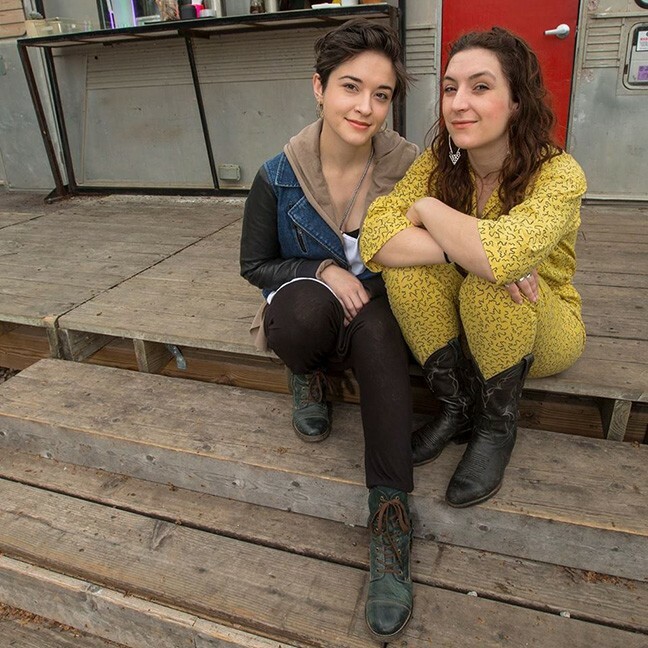 Both partners in this Chicago-based female duo are classically trained pianists who opted to play guitars in Ohmme as a self-imposed creative limitation. Their fully ingested musical theory and its resulting command of the circle of fifths permeates the deceptively basic fabric of Ohmme’s music—percussive, often mono-note guitars (sounds like Wire! ), held down by snare-driven pocket beats. (Dear God, will “Icon” get under your skin and live there for weeks and weeks.) Through circular, perfectly-pitched harmonies, Macie Steward and Sima Cunningham deliver nuanced lyrics that work on visceral and cerebral levels, “Like ladies in a French museum/Taxidermied humans, you really ought to see them.” Their vocals, breathy but matter-of-fact, like an old-time radio program, strike warm contrast to the post-modern minimalist backing. Literate and symbolically aware, they eat peaches then apples before switching over to tangerines because, they purr, in the end, “It’s all just food.” With Mute Swan and Citrus Clouds. Monday, Sept. 10. Club Congress, 311 East Congress Street. Doors at 7 p.m. $5. 16+. Details here. Whiskey Dinner at Batch. What’s better than a five-course meal? A five-course meal with whiskey throughout! Batch Cafe & Bar is hosting their first-ever whiskey dinner with chef Jamie Sly. Dishes include “Spiked Bacon Chicken Skewers,” “Overkill Whiskey Cheeseburger,” “Root Beer Whiskey Float” and more. Even if you aren’t crazy about the liquor, the locally sourced food is something we can all enjoy. 6 p.m. Monday, Sept. 10. 118 E. Congress St. $55. Details here. Dollar Night at Skate Country. Pull on your leg warmers, back comb your hair and head over to the perfect time warp that is Skate Country. From 6-8 p.m. admission is only a buck, and skate rental is 3 dollars. So, for the price of a cup of coffee you can have a wail of a time skating round and round under the lights showing off your skills. 7980 E 22nd St. Details here.